I inherited a pile of books from a teacher who was leaving our school. Hidden was a piece of gold that is really called Rust: Visitor in the Field. It's a graphic novel that the boys in my class are going to love. 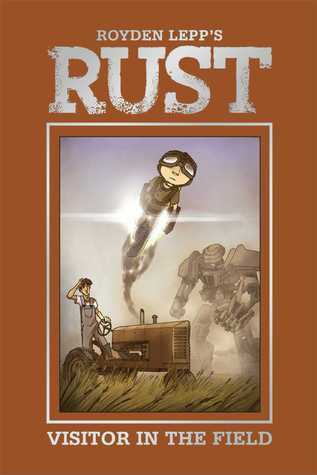 Set on a farm after a world war that was fought by people and robots, Rust chronicles a young farmer who helps save a boy with a jet pack who was being chased by a killer robot. Jet Jones feels he owes a debt to Roman and his family, so he helps out around the struggling farm. But the killer robot was just one of many, and it might be safer if Jet wasn't at the farm at all. My favorite thing about this book is that there is actually very little text. The first 30 pages are a practically wordless depiction of war. I want to use them to teach inference because Royden Lepp's illustrations tell so much. When there is text, it is simple, which will appeal to my developing readers. It's only the first in a trilogy, so I need to get the other books soon. I know once I Book Talk Rust, it won't be on my shelves for long.